Afghan Taliban narco-jihadis issued a statement saying they had restarted peace negotiations with U.S. officials “hours” after they carried out a brazen attack on Monday that left at least 45 members of Afghanistan’s intelligence agency dead at a military base near Kabul. 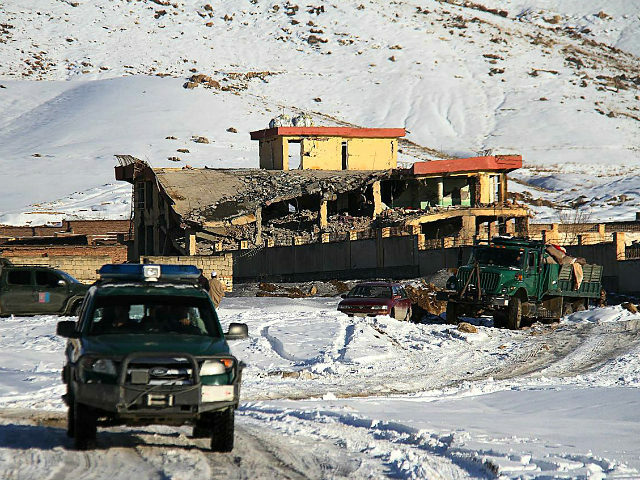 The attack, which some media organizations believe killed upwards of 100 people, took place at the Maidan Shahr intelligence training center in the capital of Maidan Wardak province outside Kabul. According to the Associated Press (AP), the new round of U.S.-Taliban negotiations is expected to carry into Tuesday. The U.S.-NATO Resolute Support (RS) reported that “enemy small arms fire” killed a U.S. service member Tuesday, marking the second American fatality this year and bringing the total number since the war began in October 2001 to about 2,278. Saying only that the “incident is under investigation,” RS did not provide additional details about who carried out the attack. However, the Taliban is the most prominent terrorist group in Afghanistan and the number one killer of American troops and Afghan National Defense and Security Forces (ANDSF), which includes military and police units. “We will share additional information as appropriate,” RS noted. Pending notification of next of kin, the Pentagon has not released the name of the service member killed in action. Several news outlets reported that the Taliban and U.S. officials led by Zalmay Khalilzad, President Donald Trump’s Afghan reconciliation envoy, resumed peace negotiations “hours” after Monday’s attack. The talks came after a brief hiatus at the behest of the terrorist group, primarily over the United States insistence that Kabul participate in the negotiations. The Taliban considers itself the only legitimate government of Afghanistan and is fighting to implement strict Islamic laws or sharia. Citing a source close to the talks, Reuters reported that the Taliban met Khalilzad in Qatar on Monday. “Following American acceptance of the agenda of ending invasion of Afghanistan and preventing Afghanistan from being used against other countries in the future, talks with American representatives took place today in Doha,” Zabihullah Mujahid, a spokesman for the Taliban spokesman, declared in a statement Monday, according to the New York Times (NYT). The Taliban statement came soon after a suicide bomber from the terrorist group rammed an armored Humvee packed with explosives into the Afghan military base in eastern Maidan Wardak province on Monday. Death toll figures for the attack vary between 45 and “more than 100.” AP noted that the Taliban also injured up to 70 people. “The base, which also serves as a training center for pro-government militias, is run by Afghanistan’s intelligence service known as the National Directorate for Security, or NDS,” AP pointed out, alluding the location of the attack. Echoing other news outlets, AP described the casualty toll as “unprecedented” for the NDS, which is among the best equipped and trained in the country. The Taliban infiltrated an Afghan intelligence base on Monday, killing dozens of people in what Afghan officials said was one of the deadliest attacks against the intelligence service in the 17-year war with the Taliban. … The attack, early Monday morning, came hours before the Taliban announced they had resumed peace talks with American officials. It was a sign, analysts said, of how violence is likely to grow deadlier even as the sides of the long war have indicated a willingness to seek a negotiated settlement. Under President Trump, the U.S. has boosted its peace-seeking efforts, making the political reconciliation between the Taliban and the Afghan government the primary tenet of its strategy to end the more than 17-year-old war. Early this month, the Taliban halted the negotiations over “agenda differences,” particularly the involvement of officials from the Afghan government, a truce requested by U.S.-backed Kabul, and a prisoner exchange the Taliban demanded. Taliban terrorists generate most of their funding from trafficking and cultivating opium and its heroin derivative, a small portion of which is fueling the historic fatal drug overdose epidemic in the United States. The Taliban currently holds unprecedented sway in almost 45 percent of Afghanistan and carries out attacks on a daily basis despite the ongoing peace negotiations. Since they took charge of security responsibilities at the end of 2014, the Afghan security forces have suffered most of the casualties, reaching a total fatality count that some U.S. military officials have described as unsustainable. The Taliban has killed a record number of Afghan security forces and civilians.